Buying the gift of a chocolate club for someone else is not the same as purchasing one for yourself. You have your own tastes, preferences and what makes you unique can also make it difficult to pick the right chocolate club as a gift for someone else. Not to worry. With this guide, you will be a chocolate club gift-giving guru in no time – and hey, if they don’t like it, who says you won’t get it back? There are literally dozens of chocolate clubs out there. If you were to search online, you would find pages full of local companies and even corporations offering chocolate club memberships. The most important thing when sifting through the choices is what you are actually paying for. Read the fine print and make sure they are not charging you for extras like shipping. Also, when comparing companies, consider reliability and reputation. Some companies are notorious for offering low-priced clubs, but then fail at customer service or even timely deliveries. Because this is a gift, you cannot risk it showing up weeks later – or worse, damaged during shipping. Everyone loves chocolate, but all chocolate lovers have their preferences – and sadly, their dislikes. Consider the person receiving the chocolate club gift. Are they a truffle lover? Do they prefer variety instead of just one type of chocolate? Perhaps they love dark chocolate? These are all things you can consider when narrowing down your club choices. Some clubs offer multiple memberships to cater such needs – such as the Chocolate.org list of club options. Chocolate can vary dramatically in quality – and that is a big deal, especially when gifting to a chocolate lover. Take into account the types of chocolate that will arrive. Some clubs dabble in the unexpected, out-of-the-box and even exotic varieties, such as Dear Coco, while others stick to the classics everyone knows and loves, such as Clubs of America. Every gift comes with a budget. While quality, variety and reliability are always important, so is staying within your budget. Chocolate Club memberships can be expensive, but there are also an equal number that are budget-friendly. For example, you could give the gift of the Chocolate Truffle Club by Chocolate.org for $28 per month (includes free shipping). 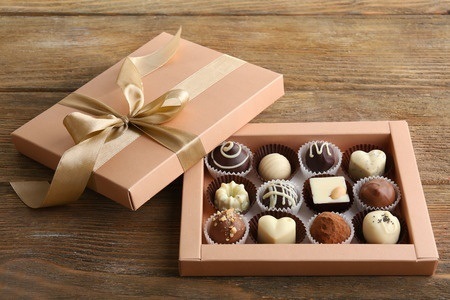 If you want more variety than just truffles, you can try the Chocolate Fanatics Club by Lake Champlain or Chocolate of the Month Club by Clubs of America – both under $35 per month. No matter who you are gifting your chocolate club membership too, following these key things will help you narrow down the choices and hopefully, give the gift they will never forget.